The Colonial Diner on Route 18 has been a staple in East Brunswick for decades–many a high-school lunch has been eaten there, many a late-night afterparty snack chowed down, and many a family Sunday breakfast devoured. We have eaten so many meals there it is impossible to count. The restaurant offers classic diner fare, some with a gourmet tweak, as well as a salad/soup/baked potato bar and a variety of oversized cakes and pastries. It used to be part of the Americana group (see other posts…) but we recently learned it has gone solo (oddly not reflected on the website). That doesn’t stop it from offering tasty pancakes, great feta crepes, burgers (veggie and non), salads and more. 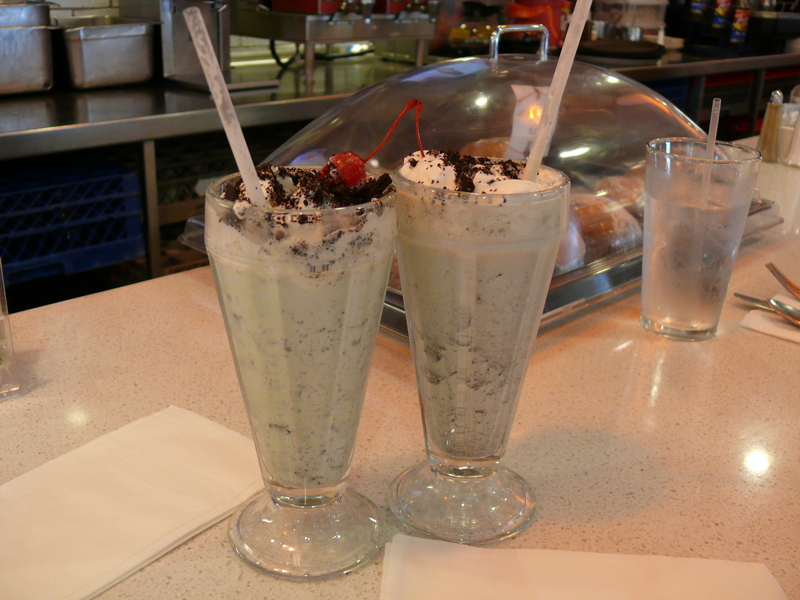 We visited recently and finally ordered something we’ve been eyeing on the menu for years–the Girl Scout Cookie milkshake, a concoction of chocolate chip mint ice cream, oreos, milk and whipped cream–a decadent indulgence. Next time perhaps the Granny Smith apple pancakes… Open 6 am to 11 pm weekdays, til midnight Friday and Saturday.